What is Profound Meditation Program 3.0? Why should you care about another program that is designed to help you achieve a state of meditation? If you’ve mastered the art of meditation and can achieve a stillness in the swirling chaos each day, then you might not benefit from this program, it’s true. For the average person who is trying to establish a schedule that includes meditation, however, Profound Meditation Program 3.0 can help to establish a routine that sticks. Why Is the Profound Meditation Program 3.0 So Important? You can become more resilient to stress. You can embrace more creativity. You can become more focused. You can enhance your relaxation. Meditation does more than just provide a short-term benefit to help you get through a stressful day. It also helps to bridge the gap between the conscious and the sub-conscious mind so that you have the ability to get to know your core being. When you are in touch with the authentic self, you have the ability to deepen and even evolve your spiritual life so that it can help you help others, bringing a greater amount of success into the world. 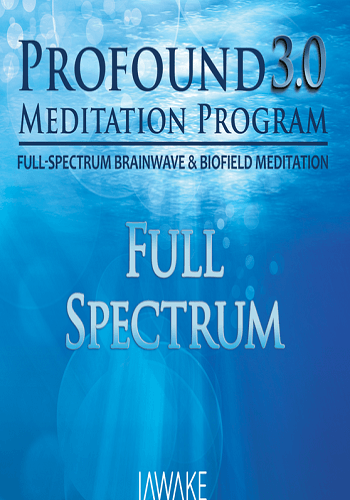 Profound Meditation Program 3.0 is 19 audio tracks that cover over 7 hours of advanced meditation technology. Incorporating spectrum brainwave and biofield meditation technology, this program will help you finally push away those penetrating, racing thoughts that can quickly disturb or even end a meditation session. Instead of frustration, you’ll come away with bliss. As you taste the wonders of what meditation can bring to your life, you’ll want to experience those benefits even more! That’s why the Profound Meditation Program 3.0 is so important to each and every person. It will help you cope with and eventually resolve difficult emotions. You can improve your mental stability. Most importantly, you can just learn to be you once again! Profound Meditation Program 3.0 provides 180 minutes of Primary Meditation Tracks to enhance what you may already be doing within your meditation. There are 9 20-minute tracks that are on 3 CDs which cover 3 tiers of progressive stimulation. Using the latest research in neuroscience, each track creates an increased emotional, mental, and spiritual coherence. This leads to improved feels of well-being on a consistent, daily basis. What is so great about the primary meditation tracks is that they are fully scalable. You can integrate them into your current meditation routine, no matter how long you try to meditate each day. You’re able to use different tracks on different days to produce the results you want from your meditation time as well. You are not forced into a specific system which requires you to progress through various levels. You will also find Releasing Meditation Tracks included with the Profound Meditation Program 3.0 download. These tracks are included on a single CD, providing 60 minutes of support with three 20-minute tracks. The advantage of using this section of the program is that it encourages the brain to rest. If your meditation time tends to be in the afternoon, after you’ve been dealing with high levels of stress, then these tracks help to encourage a mental recovery. You receive periods of intensive meditation. Then you receive periods of rest to help you reflect on that recent exploration. The Releasing Meditation Tracks encourage deeper emotional releases as well, encouraging freedom from negative emotions that may be bothering you. When you’re experiencing distractions from your regular meditation time because your emotional state is unbalanced, these tracks are a wonderful way to re-establish your center. 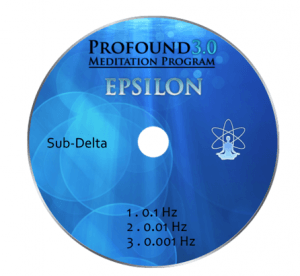 The third component of the Profound Meditation Program 3.0 download is the Epsilon Meditation Tracks that are included on a single CD. You’ll receive 60 minutes, over 3 tracks, with frequencies that range from 0.1 Hz to 0.001 Hz. With this section of the program, you gain the ability to progress deeper into your meditation state than you may have thought possible. When meditating within the ultra-low frequencies, there are fresher insights to be found. You feel more energized after the experience. There are times when you may even feel more confident about the next steps you must take in whatever situation you happen to be. With the Epsilon Meditation Tracks, meditation becomes more than another personal practice. It becomes a daily adventure that you look forward to having because there always seems to be something new about yourself that you can find. 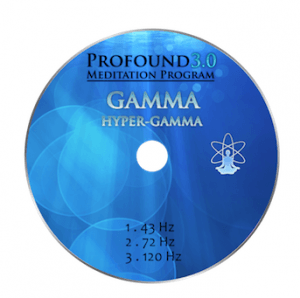 There is also the Gamma and Hyper-Gamma Meditation Tracks to consider as part of Profound Meditation Program 3.0 as well. This section is also on 1 CD, covering 60 minutes over three 20-minute tracks. For those practicing loving-kindness meditation, the results are immediate with this track. Not only can you feel the compassion for those you love flow through you during your time of meditation, there is a unique energy which develops from the experience. These tracks use frequencies at 43 Hz, 72 Hz, and 120 Hz respectively to generate results. The recommendation is to use the Gamma and Hyper-Gamma Meditation Tracks every third day or so to create a full-spectrum meditation practice. If you are already practicing loving-kindness meditation, then using these tracks will provide you with greater depth and consciousness as you extend your blessings. When you order the Profound Meditation Program 3.0 download with either the Core or Full Spectrum option, you’re also given a special bonus. 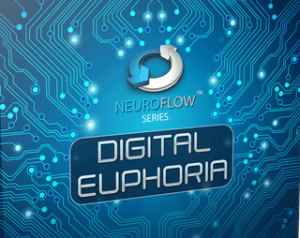 It is a special edition track called Digital Euphoria. The goal of this bonus track is to replicate the physical sensations one experiences when they exercise. Precision frequencies are used on this 70-minute bonus track to generate the brainwave patterns necessary for endorphin and serotonin production that create a sense of euphoria. Because it is one continuous track, using Digital Euphoria while jogging, working out at the gym, or even doing house chores helps to create reliable results that help you to feel good. It is important to point out that these tracks are not guided meditation audio. They are tracks which are designed to tune your brain and central nervous system with precision through neurotechnology and biofield energy medicine to transform your meditation time. It’s important to note that the Profound Meditation Program 3.0 isn’t designed to replace any meditation program that you have in place. It isn’t a substitute for traditional meditation techniques that have been practiced for nearly 4,000 years in some places of the world! What this program is designed to do is help you achieve your life goals by enhancing the effects of each meditation session. This can help those who are first starting to meditate experience a deeper overall satisfaction with the experience. Don’t worry! You’re not cheating by using a product like this to help guide your meditation sessions. People have benefited from the use of guided meditation for centuries and this program just puts those proven practices into the palm of your hand or onto a CD that you can play at home. Think about the costs of going to a guided meditation session and you’ll quickly see how fast this program can pay for itself within the first year! The benefits go beyond saving money, however, because you’ll also create more satisfaction and stability with daily meditation in your life. With Profound Meditation Program 3.0, you’ll actually want to seek out your meditation time every day! As you continue along this journey toward inner peace and perfection, you’ll find that things that once seemed difficult are simple and easy. Goals that seemed to be far away? They’re within your grasp! When you tap into the creative centers of your inner, authentic self, you can access new levels of imagination that will deeply enhance your personal and professional life. It all starts when you make the commitment to yourself. In order for the Profound Meditation Program 3.0 to work, you’ve got to make time for it to work. Whether you take a lunch break to meditate, put time in during the morning routine, or end your day with some meditation, the benefits will be realized no matter when you infuse this program into your routine. Without the commitment to change, however, nothing will be achieved. You’ll just waste your money! How Is Profound Meditation Program 3.0 Different From Other Programs? 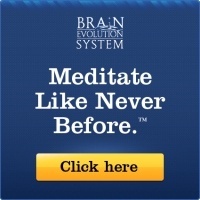 There are a lot of brainwave entrainment programs that are available on the market today. Many of them use the combination of isochronic tones and binaural beats to specifically tune your mental patterns into specific waves that have been associated with meditative awareness for nearly a century. 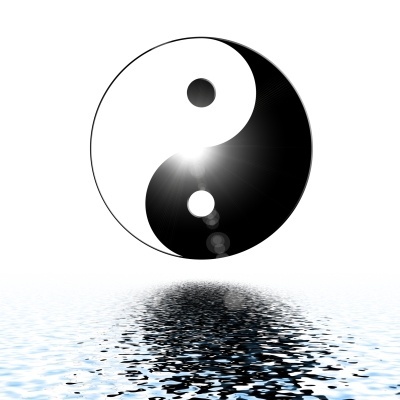 What is Profound Meditation Program 3.0 then… just a new version of this technology? It is different because it layers the levels of entrainment in a more digestible format for your brain to accept. This makes it better! If you’ve ever tried some of the earlier brainwave entrainment products, then you know how quickly your meditative state can turn into one of anxiety with the wrong tuning, tempo, or beats. The other unique aspect of this program is that it also incorporates biofield entrainment technology into each of the 19 tracks. It’s not something you’ll find anywhere else but in this program! It’s an innovative development that integrates digital encoding with energy medicine to help you enhance whatever time you can set aside to meditate and get a better result from those efforts every single time. Increase your energy. As you meditate, you’re actually conditioning your body to accept a new routine of communication. This allows you to deeply focus on more than just a meditative state. Whether you need to bear down on a workout or you’ve got a major test that you need to study for, this program will give you the mental energy you need to have a strong focus. Make tasks effortless. With a better focus, there are fewer distractions that will rob you of precious time that you may need on a task. You’ll have a sharp precision that will let you do one task at a time faster and with better quality than ever before. Stop stress in its tracks. When you have the biofield patterns surrounding you, your mind becomes better equipped to cope with stress. This will increase your confidence and you’ll be able to shake off the bad stuff quickly and repeatedly. Eliminate barriers. In a society that demands instant results, it is difficult to begin a long-term practice like meditation. It can sometimes take decades to master the practice of meditation, but with Profound Meditation Program 3.0, you can eliminate the barriers that would normally keep you from achieving the small successes you need to continue toward long-term success. Sleep better. One of the biggest causes of insomnia today is the combination of racing thoughts, worries about stress, and creating plans for the next day, week, or even year. As night turns into day and you toss and turn, you end up feeling miserable, right? With a stabilized mental center, you can quickly get to sleep, stay asleep longer, and be more rested at the start of every day. Are you ready to discover what Profound Meditation Program 3.0 could do for you today? This powerful, yet gentle brain entrainment system can calm down your spirit and give you the chance to have a meaningful conversation with yourself! It all starts with your decision to try this program today. Is It Time To Transform Your Life? Do you find yourself getting irritable by the end of the day? When 2pm hits, does your body hit the wall and you find yourself scrambling for a quick pick-me-up? Instead of reaching for the coffee that can make you shaky, jittery, and even more irritable, it could mean that it’s time to try some meditation for a quick mental energy boost! Profound Meditation Program 3.0 will help you fight through the mental fatigue that robs you of your creativity and insight. It will give you a higher degree of concentration so that you can focus on any task that you need to complete. You’ll feel calmer, more alert, and clearer than you ever have before. Best of all, if you find that for some reason this cutting edge technology doesn’t help you find a better path in your daily meditation, then you can get a complete refund by just sending an e-mail that requests it. Any science that involves the human body is a unique field in that every person has a unique make-up and chemistry. What works for some people may not work for everyone. With 90 days to try out this system without risk, there’s really nothing to lose! With so much to gain, now is the time to take action and begin or enhance your quest to achieve a beneficial state of meditation. Is Sleep Paralysis Dangerous and Should You be Afraid of It?